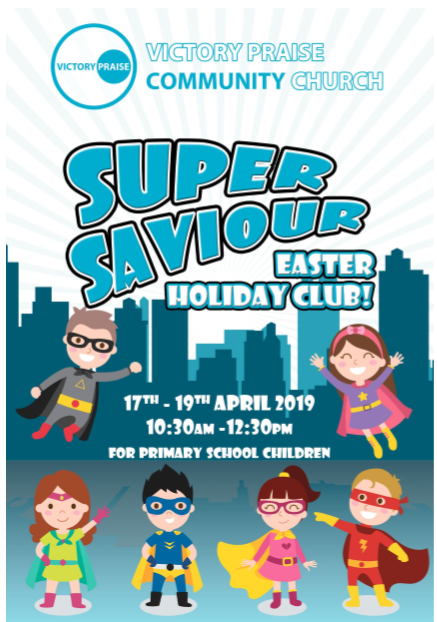 A Super Saviour Easter Holiday Club will sweep into action at Victory Praise Community Church, Ballymena from Wednesday 17th until Friday 19th April 2019. Young superheroes of primary school aged are welcome to fly in each morning from 10:30am-12:30pm for games, crafts, Bible stories and lots more. “Easter is a very special time of year for everyone who loves Jesus. At our special club, we will find that He came to be our Saviour and discover how everyone who really trusts Him can be His friend now and forever. from Wednesday 17th until Friday 19th April 2019. Victory Praise Community Church is located in Pennybridge Industrial Estate, Ballymena BT42 3HB. To find out more about any aspect of Victory Praise Community Church, telephone 028 2564 2226 or visit their website here. You can also find them on Facebook here.